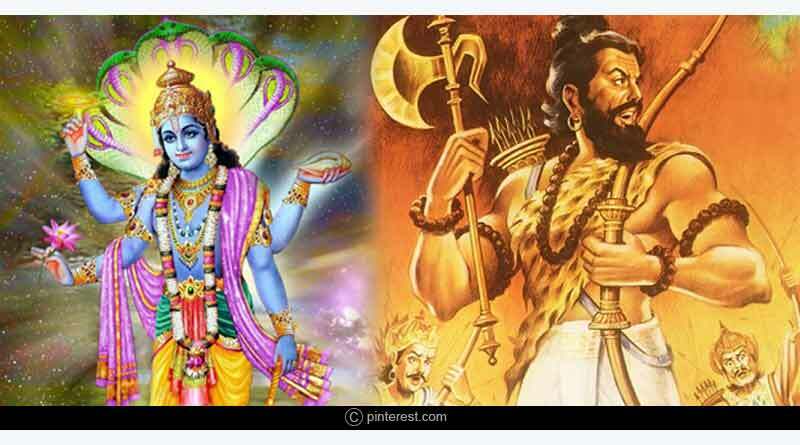 Do you know the legend of Parashurama avatar of Lord Vishnu? 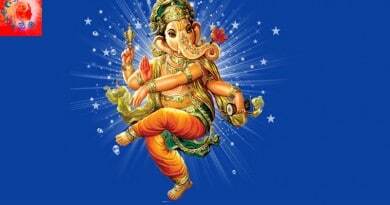 Lord Vishnu is one of the cardinal gods of the Hindu trilogy of Brahma, Vishnu and Mahesh (Shiva). He is also known as the ‘Dashavatara’ which means that he has taken ten avatars or incarnations in different yugas or eras to save mankind from the evil. One of Lord Vishnu’s avatars is that of Brahmana Parashurama. Lord Vishnu incarnates himself as a Brahmana (priest) known as Parashurama in the world. Lord Parashurama belongs to the entire Hindu society. He came to this world to punish all the Kshatriyas (the warrior class), one of the four varnas (a Sanskrit term) or classes of the Hindu society who had become arrogant. They were suppressing the Brahmins and hindered their religious and spiritual practices. He was the son of Jamadagni and Renuka. Rishi Jamadagni was well-known for his temper. Parashurama was a devotee of Shiva and from his ardent devotion and tough penance he received a Parshu (a divine weapon) as a boon thus the name, Parashurama was given to him. As a child, Parashurama was a keen learner and he always obeyed his father Rishi Jamadagni. He was the first Brahmin warrior, also known as Brahmakshatriya. His mother Renuka Devi was the daughter of Kshatriyas. After receiving the divine weapon ‘Parshu’ from Lord Shiva it became impossible for anyone on the earth to defeat him. Rishi Jamadagni and Renuka Devi were not only blessed to have Parashurama as their son but they were also given the Kamadhenu, a divine cow. Since the Kamadhenu resided in Rishi Jamadagni’s hermitage which was in king Kartavirya’s kingdom, the cow supplied the kingdom with abundance. King’s minister Chandragupta advised the king to capture the miraculous cow. But Rishi Jamadagni did not agree to give away the cow. At this, the minister abducts the cow. As Rishi Jamadagni got to know about the instance, he killed the King and got back Kamadhenu. As the son of the king realized the death of his father he goes and slays Rishi Jamadagni. Parashurama then avenges the death of his father by killing all Kshatriyas in 21 battles. 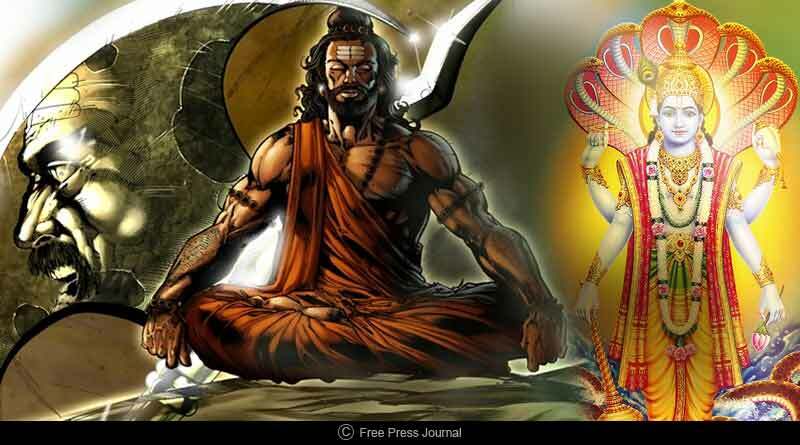 As per different belief systems, there are different stories about the Parashurama avatar of Lord Vishnu. One of tales is, when Lord Ganesha in the Satyuga stopped Parashurama from Shiva Darshan, infuriated Parashurama attacked him, and causing a tusk of Ganesh to be broken. Hence, he came to be called as Ekadanta. As per the Hindu epic Mahabharata, Lord Parashurama also gave arm training to Bhishma Pitama, Drona and Karna (the characters of the epic). In this way, Parashurama has many tales related to his life and existence. It is also believed that he still lives on the earth and will teach war skills to Kalki, the tenth avatar of Vishnu, who will come to earth at the end of Kaliyuga. For more articles like the story of Parashurama Avatar of Lord Vishnu, do Subscribe to our newsletter and follow us on Facebook, Twitter and Google+.